Around June 2011, I answered a phone call from the most recognisable coaching voice in football, Allan ‘Yabby’ Jeans. There was not a player Allan had coached, who had not tried to speak like ‘Yab’. I still hear Hawk players in the media tell famous stories, and with varying degrees of merit, tell it as Yabby would with all the crescendos, pauses and inflections. But this was a conversation like no other I’d experienced. Allan was organising the speakers for his funeral service. He wanted all of the clubs he’d coached to be represented and asked me to speak on behalf of the Richmond Football Club, his final and short-lived coaching stint. At the risk of sounding indulgent, the 12 months we worked together was the most significant of my football life. Yes, I learned a great deal from a coaching legend, his rare insight and understanding of the game and those who played it well. More importantly, I established an association which I’d like to call friendship that would last another twenty years, until just a few weeks after receiving this phone call. Here are the words from his funeral on behalf of the Richmond Football Club. It would be rare that a football conversation would pass with Yabby without some reference to a player who he had dropped from a grand final team. One sensed that the moment was burned into Yabby’s soul as it surely did with the player concerned. These memories for Yab, were as profound as the outcome of the game itself. In our game dreams become hope. Hope becomes expectation, often without substance or rationale. For a man like Yab, with a propensity to personalise obligation like no other, he was often required to do some very heavy lifting. 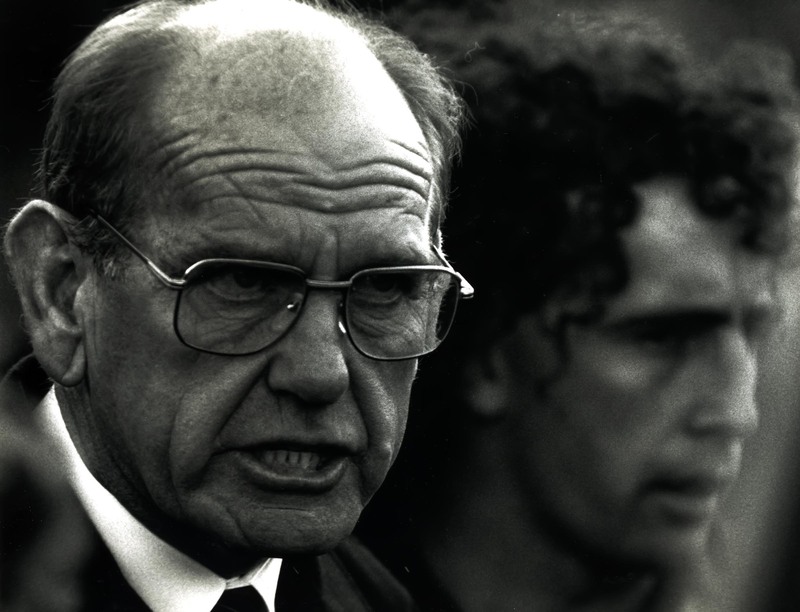 So it was when Yab was appointed Senior Coach of the Richmond Football Club in 1992. Such were the circumstances of his appointment, and whilst he would never be so indulgent to say it himself, he clearly understood that dreams had already become expectation by the time he had donned the yellow and black tracksuit. Here was a proud football club, Tigerland, dragging itself up by what were very frayed boot laces, its skin recently saved by the shaking of tins, and the passions stirred by the appointment of an icon coach arriving into the dilapidated rooms which seemed to be held together by nothing more than the smell of liniment, ankle tape and the ambitions of young men yearning to be led. Our game likes to look at the events of history as a predictor for the future as though somehow we can will these events to repeat themselves. When Allan Jeans was announced as coach of Richmond, immediate reference was made to the appointment of the first non-Richmond person for almost 30 years, in fact the first since Len Smith in the mid-60s, who himself was the first non-Tiger coach that anyone could recall. The appointment of Len Smith at Richmond would be a catalyst to a great Tiger era, after many years in the doldrums, with the Tom Hafey coached club becoming the team of their generation. Nothing less was expected of Allan Jeans when he became coach of Richmond. Adding to the colour of this story was Len Smith, the lesser-known brother of coaching legend Norm was also a great mentor of Yab’s. Len is widely credited for the invention of the modern running game, and his handwritten exercise books on football are the stuff of football folklore. Len shared these notes with a young Allan Jeans, although Yabby somehow never seemed young, as he prepared his St Kilda team for the 1965 Grand Final. To say the Saints were inexperienced on the big day would be an understatement. It was only their second Grand Final and their first since 1913. Yab kept the letters from Len, and I am sure he read them often, particularly in the last months of his life. They gave him context as the coach he was then, and the coach he would become. History in fact did repeat, as with Len Smith, Yabby’s stint as Senior Coach of the Tigers would be very short – just one season before ill health cut short his time, but in many ways didn’t reduce the impact on those young ambitious men, most of whom would reflect on the time shared as the most significant of their lives. The reason for this is simple. For Allan Jeans, identity was fundamental, and he educated and coached based on ensuring you had an understanding of where you have come from, where your place is now, and providing a clear understanding of where you were heading. This was not a compartmentalised thing – it was one continuum – much like the game plan he preached and his famous three phases. The basis from which he built this was trust, and Yab was the type of person who trusted easily, and trusted freely. Whilst he had a somewhat intimidating veneer, his warmth and wisdom quickly become apparent, as he did what he could to help you find who you are, what you want to be, and what you want to stand for. And for many young men finding their way in this most distracted of environments, identity can be elusive. You quickly learn however, to benefit from the Yabby’s wisened methodology meant leaving your ego at the door, opening yourself up knowing that your confidences were safe, and you would be emboldened by Yab’s preparedness to reciprocate your openness. Whilst the Yabby voice is legendary, his silences were often more profound. “I was born with big ears, so I figured I might as well use them”, he would say, and listen he would. He also had a unique way of creating the space required for you to work it out for yourself – surely the best form of coaching. He was also the master of the metaphor, often used to provide perspective and reality for a player who may be a tad ahead of himself so as to ensure they knew their place in the natural order. I remember him talking to a young Tiger Tim Powell, who had played a pretty good game off half-back at Victoria Park against the Magpies. After receiving praise, Powelly mentioned his disappointment at not being given a chance to play on Peter Daicos who had kicked a match-winning 7 goals. “Son, you’re a car salesmen aren’t you?” asks Yab. “Well let me put this in a way that you should relate to”. “Well Son, you’re a Holden, and Daicos he’s a Mercedes Benz”. “Success needs no explanation, failure accepts no alibis”, he would say, knowing fully that building resilience means you have to learn from your disappointments. That’s how you find out who you are. And perhaps his best measure of character, “It’s not how you get knocked down, it’s how you get up”. When Yab arrived at Richmond, he was asked to have a photo taken with the famous tiger skin that adorned the Richmond Board table. He refused. It wasn’t a snub, he would often talk of the club as ‘your club’, rather than ‘our club’, which could be misconstrued by those who didn’t know the man. In his mind, he had to earn the right to be a part of it. For him it wasn’t a matter of signing a contract, it was about building respect, which he had earn the right – pay the price. He had a deep respect for the game, the clubs and its people. He understood the Richmond story, the club from ‘struggle town’ that had once been mighty and wanted to be mighty again. But the weight was heavy, and his health faltered, and so did the dream. He got through the year on pure courage, and his overwhelming sense of duty. Somewhere from his moments of silent reflections these past months, he realised that he wanted Richmond to be recognised on this day as one of his clubs. “They were good to me” he said, “I want people to know that, please tell them”. That photo with the Tiger skin was never taken, but the learnings are imprinted in the minds of those who happened to have the good fortune of spending just one very tough season listening to, and being listened by, Allan Jeans.